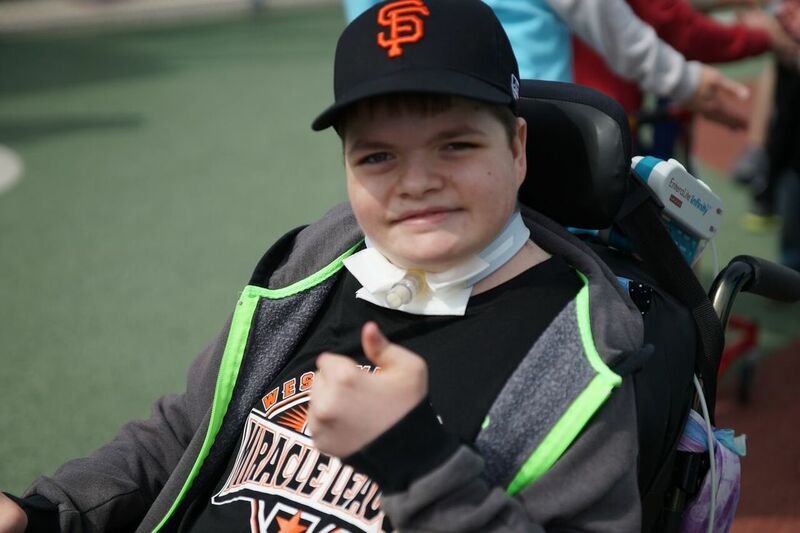 ​ Thank You for helping with the purchase of a handicap van for my son Kurtis. He is happy to have his freedom! ​Danny's coat arrived today. Thank you both and all the people behind the scenes for making this possible. Danny is richly blessed by the coat. The quality is impressive and it was so easy to put on him. He's going to have so much fun outside this year. He's always loved being outside.. you've helped make that happen again. Thank you!!! Today we received Emilee's PPod chair. We are so incredibly thankful for you helping us purchase this. We will be forever grateful. 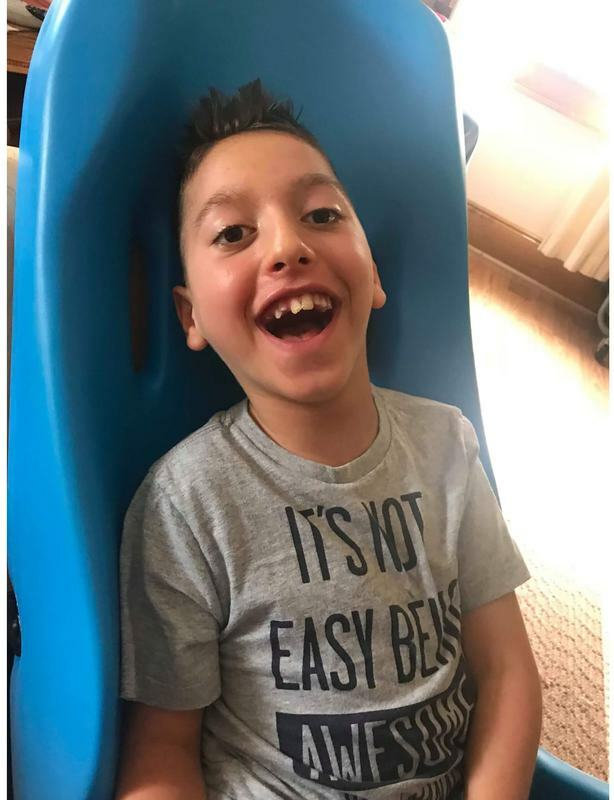 I want to thank everyone at Lori's Voice for helping Kyle to get a new special tomato chair. It arrived Friday and he has already fallen in love with it. The back of the chair is bigger and allows Kyle to hang his feeding supplies so we can tube feed him during the day. This cooling vest is AMAZING. He had so much fun dancing at his cousins wedding and then his first ever outdoor Nerf gun war at his cousins birthday party. Thank you guys so VERY VERY MUCH!!! I can't thank Lori's Voice enough for the iPad, this is going to be very helpful with Karmens education and I will be able to have all of her, 12 Dr.'s names, addresses and phone numbers at a touch. Thank you also for fixing the air in our van, now I can go away and not worry if I'm going to over heat, we love you! Thank you SO MUCH for all that you have done for Tina, Brendan and I over this past year. Lori's Voice has been absolutely wonderful to us! We cannot thank you enough. you are truly the hands/feet of Jesus to everyone around you!!!! God Bless. On Tuesday, Sophie came home from school saying she felt strong and that she was a dancer and she wanted to be in her walker for class. This is a huge deal as she gets very fatigued after a full day of school. She made it until the last 10 minutes of class! Proud ,proud mama for my motivated tweenager!! 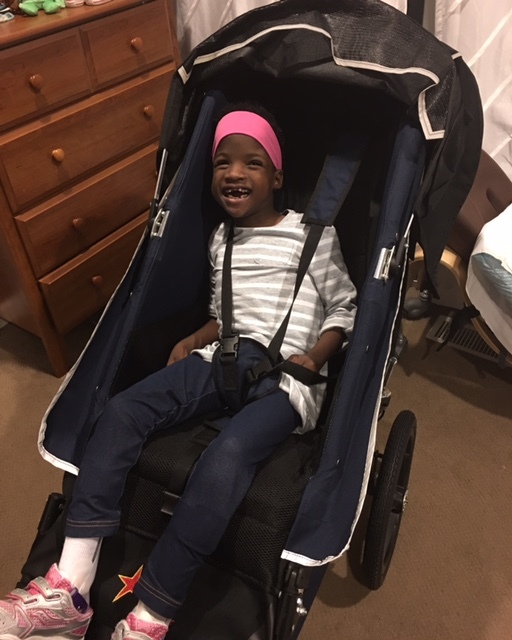 Thank you to the amazing Lori's Voice for donating the walker that is keeping Sophie’s motivation high! Katie is wearing her amazing Koolway Sports coat on this very snowy morning. We are to thankful to Lori's Voice for putting this big smile on her face! ​Thank you a million times over to Lori's Voice and everyone who fundraises and donates to them!!! Quentin and our whole family are SO happy for this hi-low base for his seat!!! With this base he can sit at floor level and play with his brothers and sister. 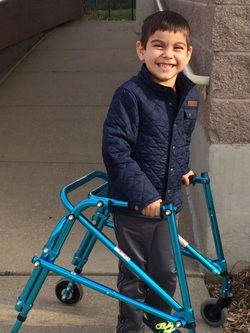 Thank you for helping to give him a fun and happy life and keep him healthy and out of the hospital!!! ❤ And thank you for the added gas card for to and from appointments! Nevaeh is HAPPY to finally get her daytime leg braces. Thank you Lori's Voice!! "We wanted to thank you so much for helping us get our Adam to Pittsburgh this year for his annual checkups with his specialists." It's amazing! And look at that face!!! He loves it and it's beautiful. Thank you so much Theresa, and Lori's Voice, for helping make this possible. Words can not express how wonderful this feels. "We love the new van, it is a God send and I didn't realize all that we couldn't do before having it. I cannot thank all of you enough for changing our lives, I don't have the words to show my gratitude." chair for Kenzie. This seating system has opened so many doors for us as a family. We can't wait until it gets warmer so we can take Kenzie on fun adventures outside! We recently were able to pick up the RGO's for April and WOW!! She was so excited to get her new RGO's. We can't thank you enough for your help in purchasing them. 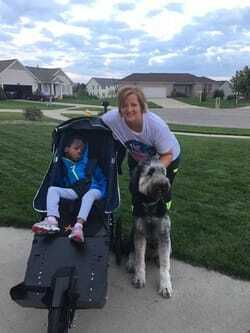 April is using her RGO's at school, in the home and in the community. We usually go to our local Walmart every weekend for a walking shopping trip. The orthotics made the back extra high for her since she cannot wear her TLSO at the same time. The RGO's fit beautifully and allow her to walk, sit with them on when needing a rest and return to walking or standing. We are so pleased to get her upright and walking again. Christabel say THANKS SO MUCH Lori's Voice for my amazing bike. Now I get to go for long bike rides with my mom and dad!!! 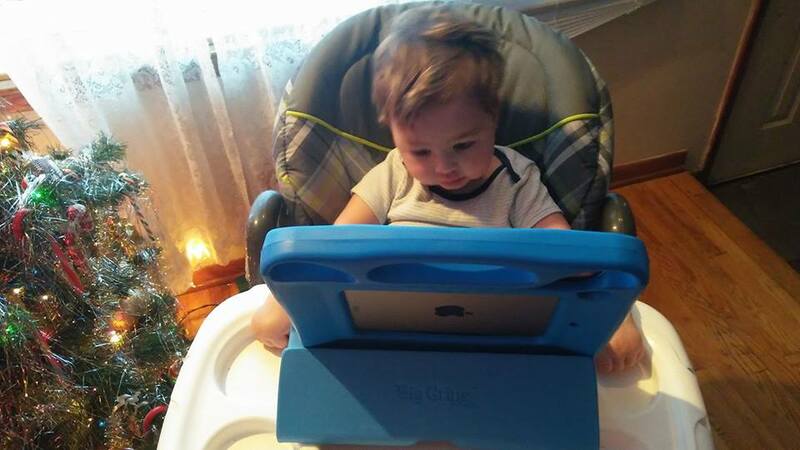 Ethan would like to say thank you for the iPad and case. We are honored to have received such a wonderful blessing. ​This truly will help us to achieve our goal of completing a mini triathlon! ​This baby is smooth like a Cadillac! We did our first of many 5k runs tonight together. This is world changing for all of us!!! The places she can go now that her wheelchair can't (trail walks with family, beach, soccer games (getting to some of the fields her brothers play on is something only atvs can get to). ​with his troop at Hoffmaster State Park. It was a journey with lots of help but he did it!!! Gramm doing things that his hard work at PT has enabled him to do. to see some positive results!" "This is the best news ever. I'm so happy I am crying. I want to take a moment and say thank you!! hotel stays when we come back was a relief. I can not explain with words! Olivia's transplant should be in June although very risky, her surgeon is wonderful and very optimistic. We all know this is what she needs and deserves. Thank you for your support it means the world to us. "What a difference the assistance from Lori's Voice has made for Ecrissa! EnCourage Institute is one of the only facilities that offers therapy with sign language"
Kirsten loves her new bike! and the smile on Kylee's face shows just how happy she is as well. I just wanted to say thank you so much for helping Brooklyn get to NubAbility Camp this year. We just got back and had an amazing time. This is her third year attending and definitely will not be the last, we wouldn't miss it! She was able to enjoy some archery at the outdoors day which she really likes. They also had a guy with no hands do a shooting demo, fishing, a bbq and dance and that was just the outdoors day. During camp itself she had some swimming lessons, her focus sport was basketball so she did a lot of that, some soccer, volleyball, football and much more. It was a great learning experience and lots of fun. There were about 135 limb different kids and their families and almost 50 accomplished limb different coaches and tons of volunteers. We cannot thank you enough. We feel it is absolutely necessary to get Brooklyn to these camps and have her be around kids like her, at camp they feel "normal" and comfortable and don't worry about being different and being asked a million questions. They just go and play the sports they love and build amazing connections. So thank you. We appreciate it more than you know. 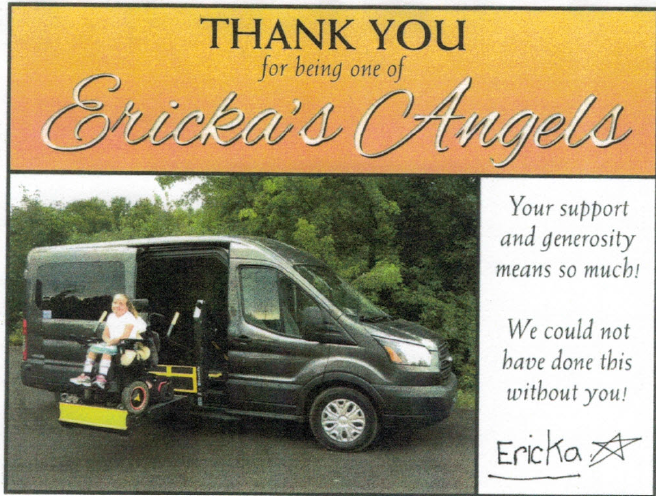 "Thank you so much for your generous contribution towards our handicap accessible van. We are very grateful to your organization in helping make our dream a reality." 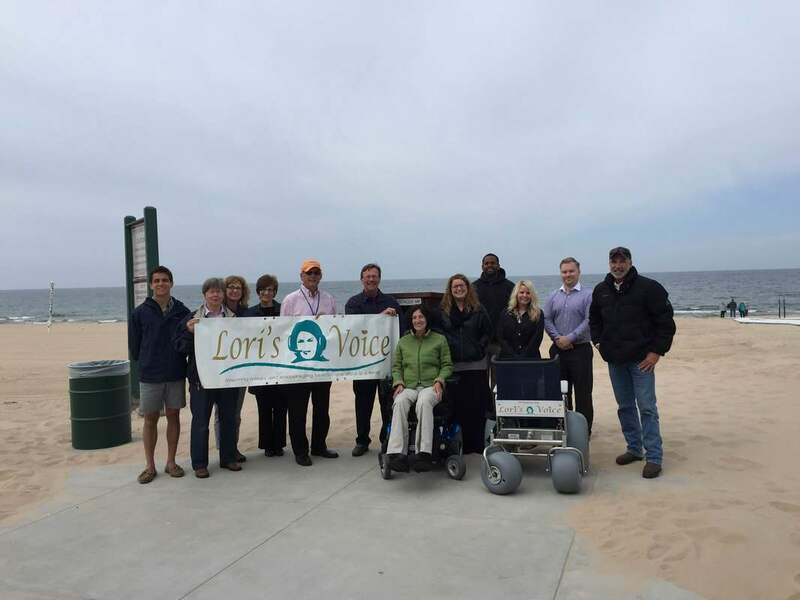 Lori’s Voice donated a beach wheelchair to the City of Grand Haven to be used at the city beach. The wheelchair was special made to be mobile in the sand. 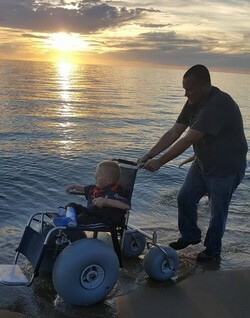 The organization has donated several beach wheelchairs to the West Michigan shoreline, including Muskegon, Ludington, Hoffmaster and Grand Rapids Millnuem Park. They are reported to be extremely helpful for many individuals on the beach. We are all inspired by Lori’s Voice and are happy to show our support!